Demand and cost of energy will increase as population and economy of the United States continue to grow. Moreover, the rapidly increasing demand for energy by developing nations such as China and India will strain energy production globally and exacerbate domestic concerns about energy production, reliability of supply and cost. China’s yearly energy consumption nearly tripled from 36.5 to 90.25 quadrillion BTU between 1999 and 2009, while India’s nearly doubled from 13 to 21.7 quadrillion BTU during the same period [EIA 2013]. Recognizing that significant energy in the US is used to heat, cool and light buildings, a number of code development bodies and standards developing organizations, including The International Code Committee (ICC) and the American Society of Heating, Refrigerating and Air- Conditioning Engineers (ASHRAE) have been actively developing and updating energy efficiency standards, code requirements and guidelines for the built environment. As these documents evolved over the past several decades, required minimum energy efficiencies of construction permitted by each have been steadily increasing. For most US climates, prescriptive building envelope requirements (R-value tables) in energy code [ASHRAE 90.1-2010]2 mandate single wythe exterior masonry walls to have continuous insulation with R-values varying from 5.7 sf•°F•h/BTU to over 15 sf•°F•h/BTU. Although prescriptive thermal transmittance values (U-values) do not require continuous insulation, they do produce similar effective envelope R-value requirements and, thus, require external insulation of varying amounts. Even though masonry walls do not need to be covered to provide finish or protection, external insulation must be protected and thus covered. These coverings impact the cost of wall systems, are less durable than masonry and will produce higher maintenance costs. Every increasing prescriptive insulation requirement often leads designers to falsely assume that building envelope high R-values are needed for the building to be considered energy efficient. Yet, increasing envelope insulation levels may have only a minimal effect on the overall building energy performance, especially for walls with a high thermal mass. Higher mass walls act to impede thermal movement through the building envelope when there are temperature fluctuations. Studies on building energy use have shown that improving efficiency of lighting, heating and cooling systems can result in a much greater reduction in energy consumption than simply increasing envelope thermal resistance, depending on building occupancy, operating schedules and climate zone6. Energy codes allow alternatives to the prescriptive path code compliance methods [IECC 2012]4. Energy Budget is one such method [ASHRAE 90.1-2010]2 [IECC 2012]4. This method more accurately predicts the impact of high thermal mass of exterior masonry walls and was used to develop more cost effective design alternatives to simple prescriptive solutions for a number of building archetypes commonly constructed with single wythe concrete masonry unit (CMU) exterior wall systems7,8. In this study, three archetype buildings were addressed. The first was a prototype warehouse – Figure 1. Second was a supermarket – Figure 2. Third was a big box retail building configured similar to the supermarket but with no freezers, produce, deli or bakery. For code compliance, the energy cost budget method requires that whole building simulations be used to verify that alternative building designs produce yearly energy costs no more than equivalent buildings configured to meet prescriptive code requirements modeled in the same cities with the same set points, schedules, etc. During investigation, DOE Energyplus energy simulation was used to conduct whole building energy analyses to establish annual energy costs for a prototype configuration using code prescriptive minimum requirements located in cities and climate zones shown in Table 1 as baselines. 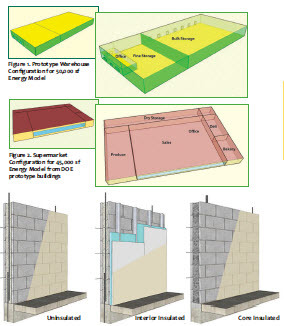 For climate zones with greater heating demands, code-prescribed exterior wall configurations required face (external/surface) insulation for exterior masonry walls (varying from 0" to 2.5" of extruded polystyrene insulation) – Figure 3. For each city, whole building energy analyses were also conducted on otherwise identical configurations having single wythe masonry walls, but without external surface-applied insulation. For these configurations, core insulation, roof insulation, lighting systems and HVAC efficiencies were adjusted until the energy analysis showed code compliance using the alternative energy cost budget method permitted by ASHRAE 90.1-2010. For alternative building configurations, code compliance was achieved using exterior 8" medium weight concrete masonry walls, grouted and reinforced vertically at 4' on-center (oc) with foam insulation injected into ungrouted CMU cores, Figure 3. A 4' reinforcing spacing was conservatively chosen. Recent changes to the Masonry Design Standard [TMS 2013]5 and ASTM C90 1 have raised minimum unit strength and ƒ'm to 2000 psi, enabling wider reinforcing spacing (> 4'), lower thermal bridging and reduced construction costs. This configuration used electronic ballasts with lower ballast factors for baseline T8 fluorescent lights. Lower ballast factor produces slightly lower, but acceptable, light levels with significantly lower energy demand. As shown in Figure 4, this configuration produced lower yearly energy costs than the baseline configuration in Climate Zones 3A through 4A and was thus code compliant, designated 8CMU Lower Ballast. In climate Zones 4B through 6B, an additional 2" of roof insulation was needed to achieve code compliance, designated 8CMU 2roof Lower Ballast. This configuration is not code compliant in Climate Zone 7. Bar chart shows yearly energy costs are greater than those of baseline configuration. In Climate Zone 7, code compliance was achieved when the alternative building configuration with 8" core insulated walls, lower ballast factor lighting and an additional 2" of roof insulation was further modified to include occupancy sensors for lights. Yearly energy cost of $19,546 ($1,286 below baseline) was code compliant. For all climate zones, an incremental construction cost estimate was conducted on building designs that use 8" CMU walls with foamed cores and lower BF lights. In Zones 4B and above, cost of additional roof insulation was included. In Zone 7, cost of occupancy sensors was also added. All costs were obtained using RSMeans construction data base (2013). Incremental construction costs for these alternative buildings configurations relative to code prescriptive baseline were calculated and summarized in Table 2. All alternative configurations were assumed to use 8" foamed CMU exterior walls, lower ballast factor lights and where applicable, additional roof insulation and occupancy sensors. When compared to code prescriptive building configurations, it is clear that alternative warehouse designs using single wythe concrete masonry walls without external insulation can readily be shown to be code compliant using whole building energy analysis. Moreover, these alternative configurations produce substantial yearly energy costs savings at significantly lower construction costs. Looking at other archetype buildings, energy analyses show in Figure 5 that supermarkets have large freezers which dominate yearly energy use that changes in energy use by other building systems are largely overshadowed. Energy analysis on this building model was thus conducted without refrigeration. Yearly energy use is shown in Figure 5 as Supermarket Baseline no refrigeration. One alternative building configuration investigated for the supermarket used 8" exterior medium weight, concrete block walls, grouted and reinforced vertically at 4'oc (conservative assumption), foam insulation injected into ungrouted CMU cells shown in Figure 3 and LED lighting instead of much lower efficiency T8 fluorescent lights (the latter meeting prescribed lighting energy performance under ASHRAE 90.1-2010). Figure 5 shows that this building configuration Supermarket no Refrig. 8CMU LED was code compliant in all Climate Zones, with yearly energy costs less than the reference baseline. Refrigeration was not included in results shown as it did not change net energy cost and allowed a better assessment of the effects of system changes on energy use. Low-rise retail entities such as Walgreens, CVS and Best Buy, often using single wythe exterior masonry walls, were the third archetype evaluated. With the exception of bakery, produce, deli and refrigeration, these entities have similar operating hours, occupancy schedules, equipment and configurations to those used for the supermarket prototype. Box retail archetype with the same basic configuration as the supermarket archetype was evaluated using analyses described for the supermarket. Results are shown in Figure 5. Configuration results are designated as Box Retail Baseline. Alternative building configurations that used 8" exterior concrete block walls, grouted and reinforced vertically with foam insulation injected into ungrouted CMU cells, and LED lighting were code compliant in all Climate Zones, Figure 5, designated as Box Retail 8CMU LED. Although not required for energy code compliance, an incremental construction cost estimate was also conducted on baseline buildings (both supermarket and box retail) and alternative designs. All costs were obtained using RSMeans construction data base (2013). Incremental construction costs for alternative building configurations (8" foamed CMU walls and LED lights) relative to the code prescriptive baseline configurations are summarized in Table 3. Supermarket and box retail building have the same differences in construction for each climate zone and thus the same differential costs. Table 3 shows that for climate zones below Zone 5, there is generally a slight increase in initial cost associated with alternative design configuration. Annual energy savings associated with the alternative configurations are much greater than initial construction costs. In every case, additional construction costs had paybacks that are significantly less than one year. Holistic energy analyses can be used effectively to demonstrate energy code compliance for the supermarket and low-rise box retail prototypes constructed with single wythe masonry walls. When compared to code prescriptive configurations, alternative single wythe configurations produce substantial yearly energy cost savings – typically above $10,000 per year. In climates where building energy costs are dominated by heating costs, there are also substantial construction cost savings. For all three archetype buildings, holistic energy analyses and the energy budget code compliance paths produced alternative designs that did not require external insulation. They were more cost effective and energy efficient than designs developed from code prescriptive requirement configurations. It is interesting to note that holistic energy analyses similar to those described here were used by the Best Buy Corporation to improve the energy efficiency of their prototype store designs. These holistic energy analyses predicted energy savings of 25% using code minimum envelope wall configurations, with a small increase in roof insulation, more efficient heating and cooling systems, and more efficient lighting systems9. This study also assessed a Colorado Best Buy store built to these specifications and found measured energy savings of 22%. By analyzing and assessing the performance of a prototype, Best Buy's prototype allows compliant stores to earn LEED certification under the LEED volume program [USGBC, 2010]. Dr W Mark McGinley, PhD, PE, FASTM, professor and Endowed Chair for Infrastructure Research in the Civil and Environmental Engineering Department at the JB Speed School of Engineering, University of Louisville, is a structural engineer and building scientist with more than 25 years of research and forensic engineering practice in building systems. Previously he chaired the Civil, Architectural, Agricultural and Environmental Engineering department at North Carolina Agricultural and Technical State University. McGinley is a recognized expert in masonry building systems and envelopes. More than 120 publications have resulted from his research on structural performance of masonry walls, water penetration experiments on envelopes and building envelope performance of brick veneer and steel stud wall systems. McGinley is active in The Masonry Society and currently chairs the Flexure, Axial & Shear Subcommittee of TMS 402/TMS 602 Building Code Requirements and Specification for Masonry Committee (formerly the Masonry Joint Standards Committee (MSJC). Previously, he served as Chair of the Reinforcing and Connectors Subcommittee of MSJC. He has been a primary author of all 7 editions of the TMS Masonry Designers Guide, former chair of Design Practices Committee, member of Research Committee, Board of Directors and Code and Standards Committee. He is actively involved with ASTM committees C12 and C15 and currently chairs the Subcommittee on Lab Accreditation and task groups on the Bond Wrench Testing Apparatus and Field Evaluation of Mortars. He received the ASTM Gilbert C Robinson Memorial Award in 2001, ASTM Award of Merit and title of Fellow in 2008 for 25 years of service. McGinley received his PhD, MSc and BSc in Civil Engineering from the University of Alberta. ASTM Standard C90 2014, Standard Specification for Loadbearing Concrete Masonry Units, ASTM International, West Conshohocken PA, January 2014. ANSI/ASHRAE Standard 90.1-2010: Energy Standard for Buildings Except Low-Rise Residential Buildings (I-P Edition). American Society of Heating, Refrigeration and Air-Conditioning Engineers 2010. EIA, International Energy Statistics, US Energy Information Administration. Web, January 30, 2013.www.eia.gov/cfapps/ipdbproject/iedindex3.cfm?tid=44 πd=44&aid=2&cid=ww,CH,IN,US,&syid=1999&eyid=20 09&unit=QBTU. IECC 2012, The International Energy Conservation Code, The international Code Council, 2012. TMS 402-13/ACI 530-13/ASCE 5-13, Building Code Requirements and Specification for Masonry Structures and Related Commentaries, The Masonry Society, Bolder CO 2013. McGinley, W Mark, Muldoon, Kevin and Riggs, Chad, Cost Effective Energy Efficient School Design: Effects of Insulation on the Energy Performance of Masonry Envelopes, Proceedings of the 12th Canadian Masonry Symposium, Vancouver BC Canada June 2012. McGinley, W Mark and Beraun, David, An Investigation of Alternative Energy Efficient Medium Sized Single Wythe Masonry Warehouse Buildings, Proceedings, 12th North American Masonry Conference, Denver CO May 2015. McGinley, W Mark and Beraun, David, An Investigation of Alternative Energy Efficient Medium Sized Single Wythe Masonry Supermarket and Box Retail Buildings, Proceedings, 12th North American Masonry Conference, Denver CO May 2015.